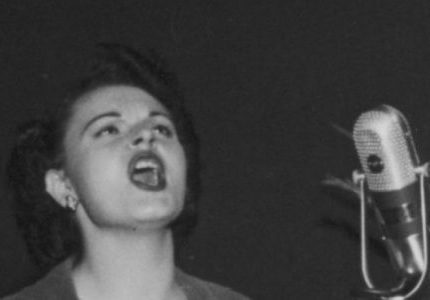 June 6, 2015 – Ruth Alice Ronnie Gilbert (the Weavers) was born on September 7, 1926 in Brooklyn, New York City. Ronnie Gilbert was no stranger to success or to controversy. Born to working-class Jewish parents in New York City, she refused to participate in her 1940s high-school senior play because she was convinced of the racial injustice of the minstrel show theme. The family moved to Washington, DC during World War II. This is where she met folklorist Alan Lomax and Woody Guthrie and other folk singers. She performed in the early 1940s with the Priority Ramblers. In the 1950s, Gilbert melded her joyous contralto with the radical voices of Pete Seeger, Lee Hays, and Fred Hellerman in their celebrated group the Weavers, which brought folk rhythms and social activism to the mainstream, even while being branded as subversives in the hysteria of the McCarthy era and blacklisted. So they were briefly one of the most popular groups in America, but were denied the opportunity to reap the benefits of their fame when they were targeted by Senator Joseph McCarthy’s investigations of suspected Communists and found themselves blacklisted. American folk singer, songwriter, actress and political activist. In 1963, divorced both from her husband and from the reigning cultural expectations of a wife, Gilbert was beginning to build a solo singing career when she met Joseph Chaikin, then a young actor/director with a fledgling experimental troupe, The Open Theater. After she concentrated on theatre, in 1968 appearing on Broadway in The Man in the Glass Booth. In the 1970s, Gilbert’s career took yet another surprising turn when she earned an M.A. in clinical psychology and worked as a therapist for a few years. After a one-off reunion with the Weavers at Carnegie Hall in 1980 Ronnie was coaxed back to folk music in 1983 by the singer Holly Near, who took her on tour as a duo and with Pete Seeger and Arlo Guthrie; they all released an album together in 1985, HARP: A Time To Sing. The 1980s saw Gilbert make her debut appearance at the Michigan Womyn’s Music Festival, reading a lesbian-themed poem. Gilbert met, was inspired by, and sang with Holly Near, recording Lifeline (live, 1983) and Singing with You (1986) with Near, and Harp (1985) with Near, Arlo Guthrie, and Pete Seeger. Gilbert’s debut solo release, The Spirit Is Free (1985) was released on the feminist Redwood label; the live recording of Love Will Find a Way followed, in 1989, on the Abbe Alice label, the collaborative product of a new alliance with manager/partner Donna Korones. In 1990, Gilbert gave the keynote speech at the annual conference of the Association of Women’s Music and Culture (AWMAC). She also performed a one-woman theater piece on the life of the legendary American labor activist Mother Jones. Intermittent reunions of the Weavers culminated in a lifetime achievement Grammy award in 2006. She celebrated her 70th birthday on tour with Holly Near; and was still touring well into her eighties. Ronnie Gilbert died in Mill Valley, California on June 6, 2015 at the age of 88.